Pietro Perugino, born Pietro Vannucci, was a painter of the Umbrian School, whose style found an influence in classic expression of the High Renaissance. 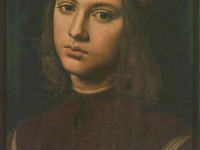 He was apprenticed at the young age of nine, to possibly Benedetto Bonfigli (1420 – 1496). 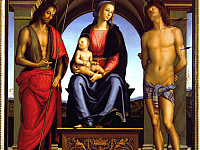 He then moved to Arezzo and then on to Florence, where he assisted Andrea del Verrocchio (1435 – 1488), alongside a young Leonardo da Vinci (1452 – 1519). Before joining the Guild of Saint Luke the 1472, he also learned the application of perspective in painting from Piero della Francesca (1412 – 1492). 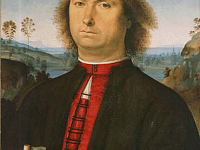 It was here in Florence that Perugino was also one of the first practitioners of painting in Oil. He returned to his native, Perugia (for which he is named) briefly, and then moved to Rome around 1480. There his works in the Sistine Chapel, in collaboration with Pinturicchio (1452 – 1513), were abandoned for Michelangelo’s (1475 – 1564) works. He then traveled back and forth between, Perugia, Florence and Rome, with commissions from his studio in Florence. Of this period, and now at the Uffizi Gallery, is his, Pietà, an uncharacteristic piece, said to be stark for an artist once sentimental and pious, though perhaps an early indication of Vasari’s claim that he was a man of little religion. Though, it has been noted that his self-portrait, also in the Uffizi Gallery, is inscribed with the religious phrase, Timete Deum, something of a contradiction for an artist who openly disbelieved in the immortality of the soul. In Perugia he was commissioned for a Hall of the Cambio (bankers), where he may have been assisted by a young Raphael (1483 – 1520). He produced several works throughout these cities, additionally in Trevi, where his last frescos were executed. Of his other works in the Uffizi Gallery are, Madonna and Child with Saints, Portrait of Francesco dell Opere, Portraits of Don Biago Milanesi and Baldassarre Vallombrosano and, Agony in the Garden.